Our third time here and it's been better each time. The dishes are so original, you won't find them anywhere else. I love the fact that the menu rotates weekly. You also won't find better fresher ingredients. That, along with quaintness of having only six tables really makes it a special culinary experience. Can't wait to go back! Finally, real Italian in NJ! 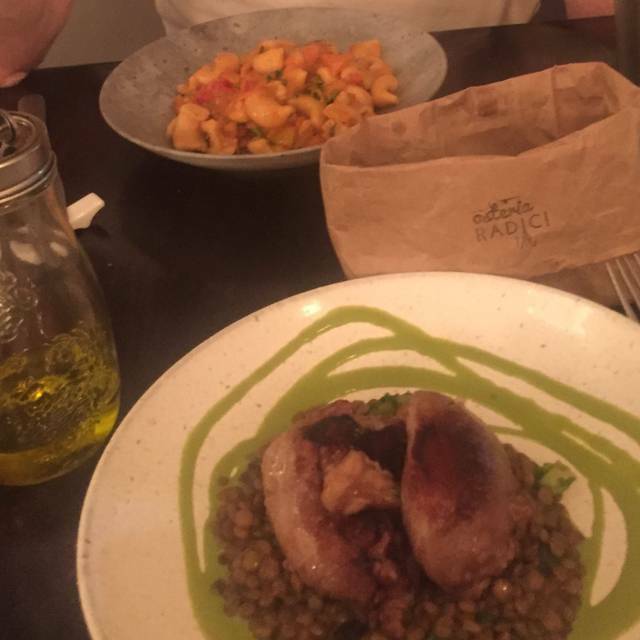 I had an absolutely wonderful experience at Osteria Radici. The food was perfectly prepared and seasoned, and the service was attentive and helpful without being overbearing. Everything from the made-in-house bread with olive oil, to the crispy pork cheek, to the perfect cappuccino was like a trip back to Italy. This ranks up there with the best meals I've had. Can't wait to go back! Excellent food. If may cost a little more then other restaurants but you get what you pay for! Worth every penny. My wife and I enjoy quality meals and the meals were top notch. If you are afraid to pay for quality, find a nice chain to go to. We prefer locations like this with excellent quality and service. Also being a BYOB is a bonus! We had a lovely dinner at Osteria Radici! Superb food in a quiet, unassuming setting in the little town in which my grandparents once lived. What a gem, and worth of the many accolades it has received! 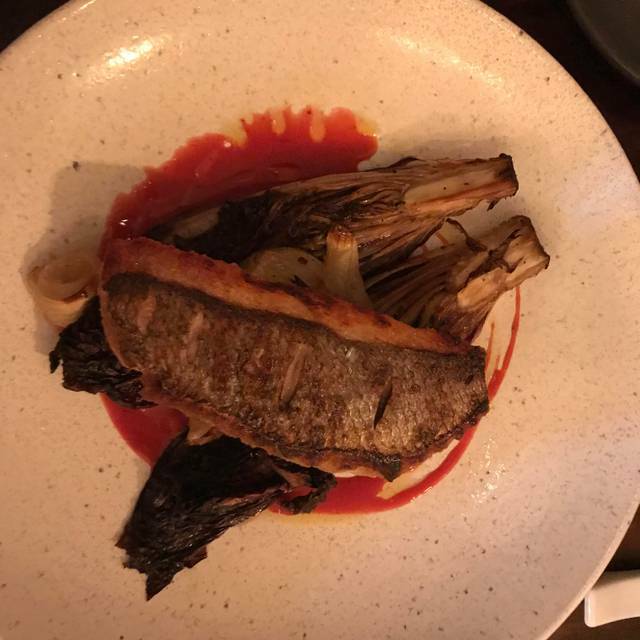 Especially loved the Sea Trout Crudo with caper honey, the Roasted Mushrooms in nduja vinaigrette, the Pressed Pork Cheese with salsa calabrese, and the Moulard Duck with hay smoked cabbage. Will definitely return! 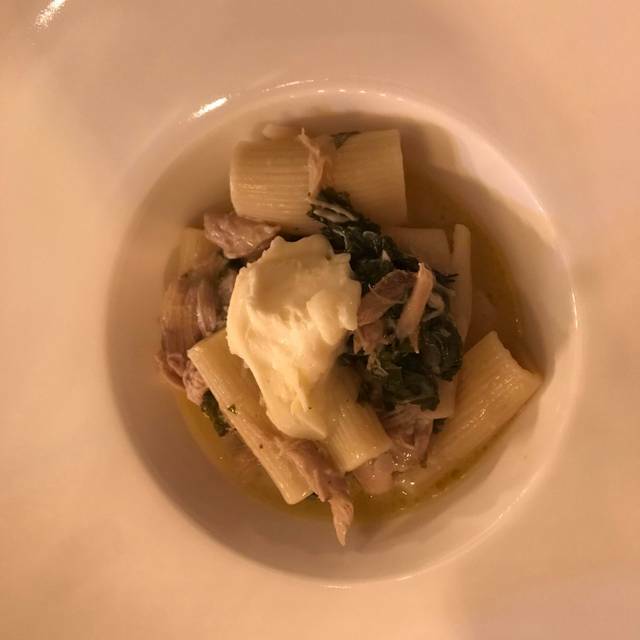 Every time we visit Osteria Radici Chef Randy succeeds in exceeding expectations. The current menu is one his best creations and proves how lucky we are to have a NY/Philly caliber restaurant in our home town. While I was a little bit intimidated by some of the menu items, our server was extremely knowledgeable and informative. He helped us to navigate the choices and we weren’t disappointed with any of his recommendations. We are looking forward to coming back again soon! Had a wonderful meal. Food and service were great! Not really much of an atmosphere. Good level of noise so that you could converse. Both tasting menu choices were absolutely brilliant. It's not for everyone because you need to be an adventurous eater and the voices are limited, but with that note of caution I would highly recommend it to anyone. It's extraordinary to find such a gem in a small town with a handful of tables turning out such great food. Clean flavors, ‘Simple’ food with a modern twist. Loved the food will definitely go back. It would be difficult to overstate how impressed we were with this amazing little restaurant! Everyone in our party fancies him/her self to be seasoned in fine dining, but rarely are we in full accord. This night (at long last) we speak as one! Make no mistake, this is not my mother’s Italian food. Our five-top sampled the entire menu, which is equally divided between two five course tasting menus. Two of us had the seafood tasting (dal mare) and two ordered from the land (dalla terra). The fifth wheel had two courses from each menu. This warrants mention: there is no requirement for the entire table to order from the tasting menus nor a minimum number of courses. Flexibility is the order of the day. Chef Randy’s food challenges each guest to reconsider the range of flavors and ingredients which commonly combine to create a dish. Indeed, there’s nothing common about this food. Consider, sea trout crudo with caper honey. For someone who once didn’t let his vegetables touch the meat, surely trout and honey would be a bridge too far. But it was amazing! That said, there are also offerings which strike a more familiar tone. The Barnegat scallops, beautifully caramelized with sunchoke and sesame provides comfort that the art of grilling scallops is not yet lost. Similarly, crispy pressed duck with broccoli rabe and salsa calabrese harkens one back to a time when duck fat, in the hands of a gifted chef, is an art form in itself. I’ve barely touched the surface here. Did I mention that the bread is homemade? But here’s the best part: Randy Forrester is a one-man show. There is no sous chef, no pastry chef, no line cook, no dishwasher. Truly, a living, breathing “Chief Cook and Bottle Washer”! Amazing! We did the full tasting menu and every dish was outstanding. The food was excellent. The ambiance is fine but was ruined by the selection of music playing; Led Zeppelin and The Who. The service lacked attentiveness and the waiter neglected to introduce himself by name. combined with favorites like the Sea Trout Crudo. missed. Can't wait to go back! Overall, was a good meal and we generally enjoy tasting menus for variety and portions. Some hits and misses as to be expected. 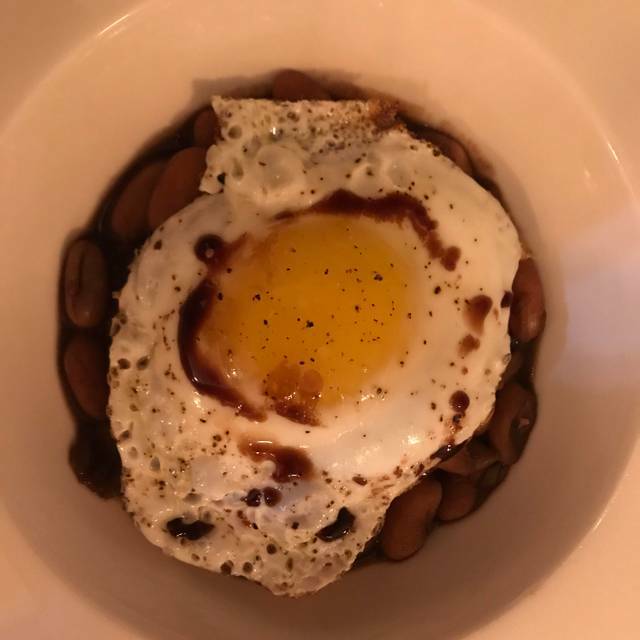 Winter beans were outstanding and the surprising standout of the two tasting menus (we had both). Spaghetti and olive oil semifredo were also very good and we would defn order again. Scallops, black bass and lamb sausage were all fine/enjoyable but didn't create a lasting impression. Sea trout crudo was interesting but the very thin slivers of fish got lost in the abundance of caper honey. The smoked cabbage and accompanying carrot and orange purees outshined the striploin itself. The gnocchi was prepared well but gamey for my palate (nothing wrong with the dish by any means). The coconut budino was our least favorite - we didn't taste any coconut in the foam and that highlighted the strange consistency. 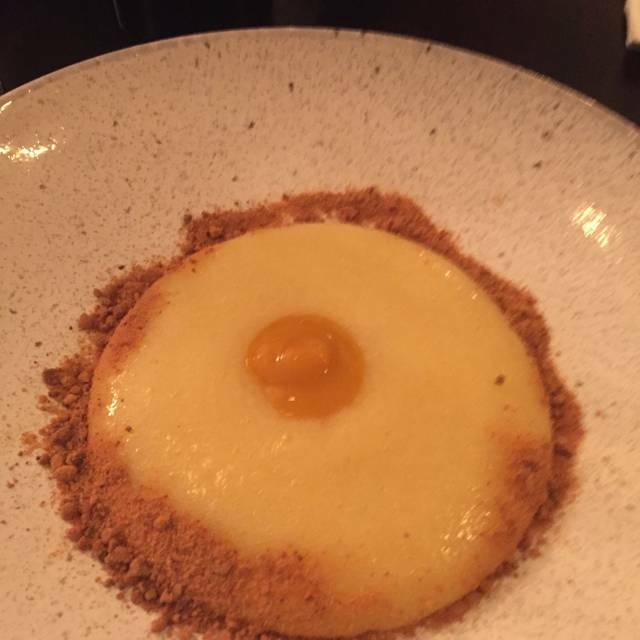 The ladyfinger crumble on top was enjoyable though. Great food! Always unique combinations that are delicious!! Can’t wait to go back!! We have driven buy many times and we finally made it in. Delicious food, very nice staff and I love that it's what I like to say: "the size of a shoebox". Menu is different every time. You pick appetizer, entree and dessert a la carte or, you can do the tasting menu. BYOB. I would definitely go again! Very limited menu and a little pricey. Atmosphere was ok but presentation could have been a little more for those prices. Quality and taste of food was very good, service was excellent. No desire to go back. 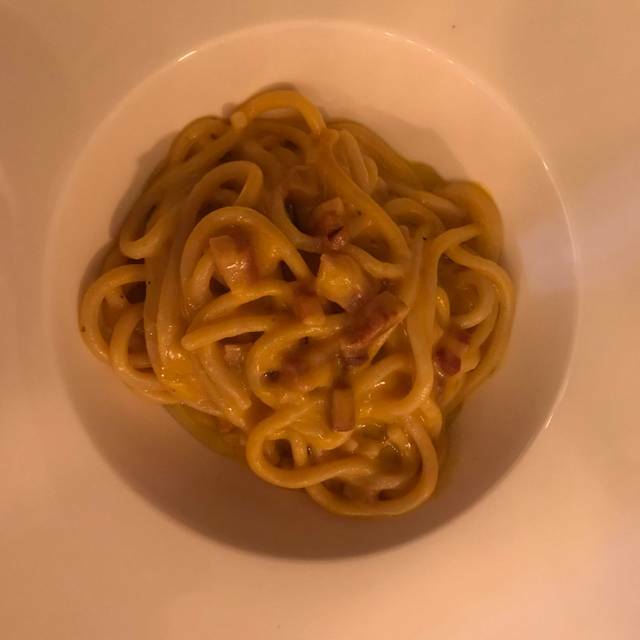 A friend of ours directed us to give Osteria Radici a try. And, what a wonderful experience we had! We chose the five course menu, and since there were two choices, we each chose a different tasting menu, thereby we were able to try 10 different items. Each was very well prepared, presented, and delicious in every respect. You should know that, if you would rather not do the tasting menu, you can order anything you’d like on the menu a la carte. The waitstaff was terrific and the owner/chef brought out several of our items and engaged us re: the inspiration and preparation of the course being brought to us. Another must is the homemade bread, which is a wonderful start to an enjoyable meal. Also, know that this is a BYOB and that, because there only about 20 seats, reservations are highly suggested, especially on Friday and Saturday evenings. 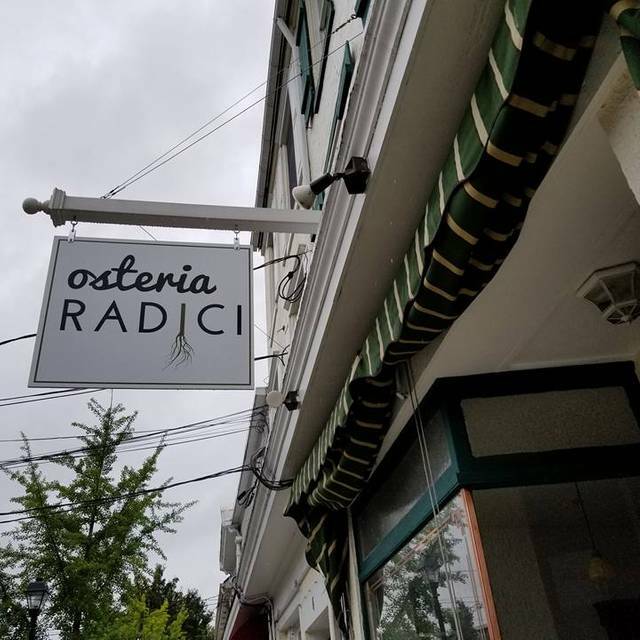 The Osteria is open for dinners only from Tuesday through Saturday. We highly recommend that you “give it a try” as we were urged to do. Fantastic blend of flavors put together for a meal that satisfies the pallet. I’m a big dude so I did the tasting and overall was pleased. I’m happy for this place to be in the neighborhood and plan on going back soon. Great Job Osteria! Great food that was very creative. Tasting menu is the way to go if eating there. My wife and I had an amazing meal last night. Our server Jocien(sorry for the spelling) was awesome and was very thorough on explaining the menu to us. The tasting menu portions are very generous and very well prepared. Each dish popped with so much flavor. Chef came out to serve a couple of our courses and took time to explain the dishes. Great experience and will be back for sure. Christmas gift to both of us from each other. We were absolutely delighted with our first, and certainly not our last!, experience at this special place. We look forward to sharing this gem with our friends and family. Looking forward to coming back soon! Great food and really attentive & polite staff. The swordfish pasta was outstanding and should not be missed. Thanks for a great date night. Hope to come back. Outstanding food and friendly service. 5 course tasting menu, one for fish and one for meat but you can mix them up or order ala carte. My wife had the meat tasting menu but the desert from the fish menu. I had the lamb shoulder and swordfish pasta. Food was the best in this area. Very accomodating to my low salt diet. Can't miss. Price what you would expect for great food. Very accommodating to Celiac/gluten free. Two five course tasting menus (sea vs land) and can mix and match by the course. Also able to order a la carte. BYOB. Intimate atmosphere and great for a special occasion. was "sea" choices while the other half was "land". The food was delicious and the chef/owner were very friendly. I highly recommend this restaurant. We thoroughly enjoyed the food and service. We especially liked the fact that Randy and Ally spent some time explaining the food selection, all of which were creative and very tasty. We are looking forward to returning. The menu is very limited; 2 apps, 2 entrees, 2 veggie courses and 2 desserts so its hit or miss with respect to liking what they are offering. Swordfish was prepared beautifully but was over salted for my taste. Veggie side (cauliflower with pancetta) was delicious. We didn't have dessert. 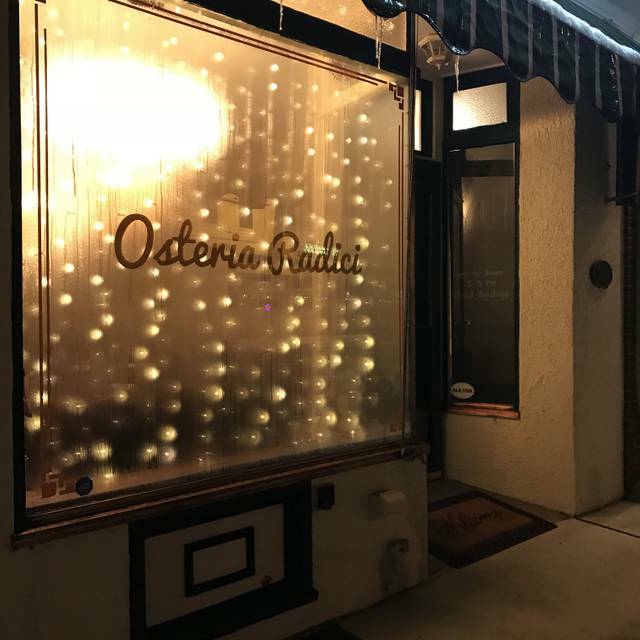 We absolutely adore Osteria! Randy and Ally are amazing hosts and the dining experience is unlike any other in this part of NJ! The presentation of every meal leaves your mouth watering before even taking a bite and once you do, it's an experience you will never forget. we are so thrilled that they are in our quaint little town! Very good restaurant with some delicious dishes. The service was also very warm and welcoming. I would only comment though that some of their dishes tend to be on the heavier side and could have some lightening elements. Finally, decided to book a reservation, after driving past it a million times. We were so glad we did. I have to admit, this is NOT a casual dining place. You have to be open to being treated to an extraordinary dining experience on THEIR terms. Thursday night menu consisted of two tasting menu choices- from the Land, or from the Sea, for $84. We chose to go with only the entree selection (mid $20), and shared an appetizer and dessert. Both presented an onslaught of flavor that rivaled the best restaurants we've eaten in. 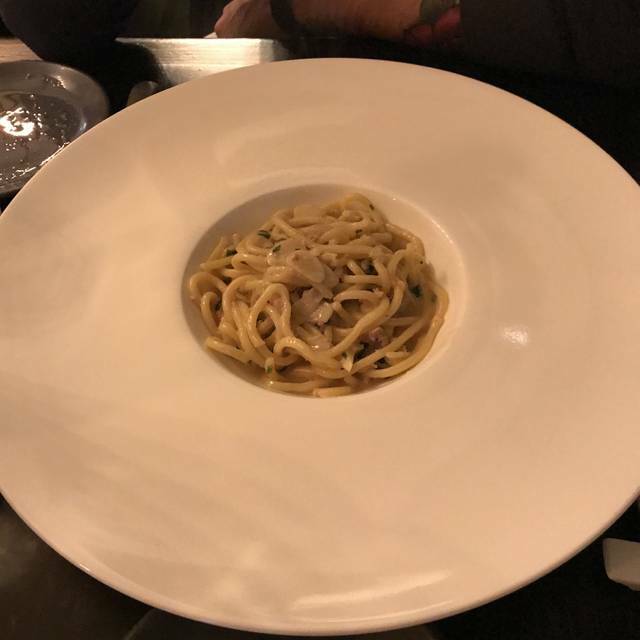 I personally chose the lamb/pasta/gorganzola; perfectly prepared pasta, just the right amount of chewy/softness, with shreds of lamb intermingled; all seasoned to perfection. This restaurant seems to be a labor of love; only a single chef, and single server servicing the 7 tables. I had a full view of the kitchen, and the chef seemed to be dancing around, lovingly preparing his dishes. Of course, expect a relaxed timetable for these gems of meals to be prepared. I'm not sure if the menu selection widens for weekend dining, but be aware that there were only two-four entrees available on the weekday night, either ala carte, or in a tasting menu. But if you do commit to dining here, you'll find out why it has received so much press in its short existence! Fantastic BYOB, great menu, easy parking, great service. Simply outstanding! Our second time to this wonderful restaurant and again it was amazing. They offer two interchangeable tasting menus. We ordered the entire land and the entire sea menus. Each and every dish was made with love and pride. And tasted great! We think Osteria Radici is one of the best restaurants in the US and it will only get better! !